Are any of you currently wearing a watch? Do you know what time it is? No? Well then, it’s my duty to inform you that it’s time to pull another slip of paper out of my Stockholm Suggestion Box! And, of course, time for me to overload you with info on the artist/s scrawled on said slip. I hope you’re mentally, physically and emotionally prepared for this. So far this season, I’ve suggested that Darin (my favourite popstar on the planet) should put his name down for Melodifestivalen 2016, and in the past I’ve singled out Robin Packalen and The Saturdays as artists I’d choose to represent Finland and the United Kingdom respectively. For my second suggestion in the lead-up to Eurovision #61, I’m aiming for the UK yet again (sorry). I couldn’t help myself – not once it occurred to me just how perfect my favourite act of the moment are for the contest, in more ways that Sanna Nielsen has Melfest entries. Now, I’m aware that, according to recent news, the BBC will be using an X Factor-style talent search to select their entrant for Stockholm rather than an internal selection (as per the past five years). This may sound like a good plan to someone who’s forgotten (or had treatment to erase from their memory) the disastrous cringefest of an outcome that prompted that switch to internal selections in the first place. Someone at the BBC – more than one someone, incredibly – thought that ‘That Sounds Good To Me’ lived up to its title back in 2010. Surely they can’t be trusted to mastermind something resembling a national final so soon? Then again, it was an NF that teamed Jade Ewen up with Sir Andrew Lloyd Webber, with the pair eventually finishing fifth in Moscow in 2009. Basically, the UK’s next ESC experience could be one heck of a ‘Come Back’…or they could end up ‘Rock Bottom’. With this NF news in mind, I know that any act I name as my ideal UK rep is now even less likely to end up being that rep. But that won’t stop me naming! So please, indulge my fantasy as I request the services of some musos I’ve been obsessed with for the majority of 2015. To cut a long story short, Years & Years = Olly Alexander, Mikey Goldsworthy and Emre Türkmen: a.k.a. two Britons and an Australian (that’d be Mikey) who make insanely cool music together, and have done since 2013. To NOT cut a long story short…here’s the long story. Once upon a time, in a mystical land known as London, a brilliant-band-to-be was born. 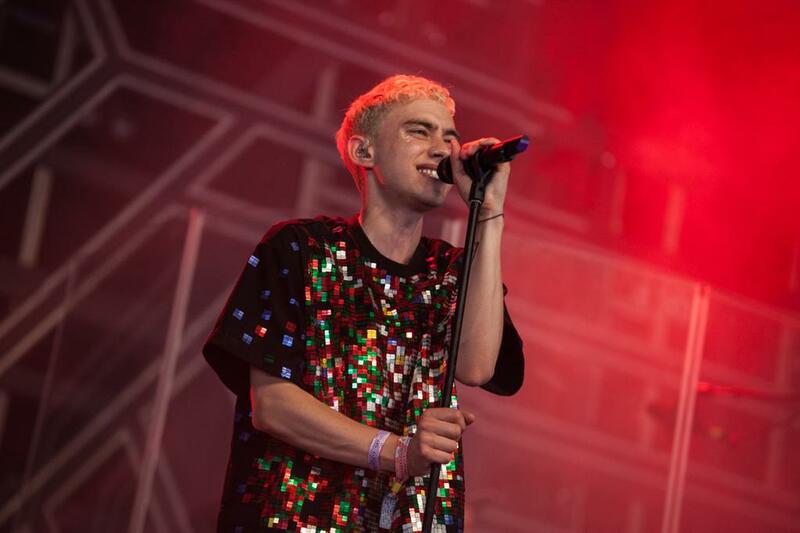 Years & Years first formed as a five-piece in 2010. Mikey, having recently migrated to the UK, met Emre online, and it wasn’t long before they both cottoned on to Olly’s vocal talents (thanks to his habit of singing in the shower, which you can hardly blame him for. The acoustics in there are second to none). That set Mikey’s mind-wheels into motion, and he and Emre were quick to get Olly in on their music-making scheme. Joined by two other likeminded musos, and with Olly as frontman, bassist Mikey and synth player Emre released their first single ‘I Wish I Knew’ in July 2012. It didn’t exactly set the charts on fire, but good things come to those who wait – and/or those who spend a little more time honing their craft. Five became three in 2013 (it was like Ginger leaving the Spice Girls all over again…I imagine), prior to the band signing with French label Kitsuné Records and releasing second single ‘Traps’, plus an accompanying EP. ‘Real’, the next single, was released in 2014, and became Years & Years’ first to chart in their homeland (albeit at #158. Everybody’s got to start somewhere). A switch of label to Polydor the same year signaled the start of better luck and bigger success for the boys. Their third EP – Take Shelter, featuring the phenom single of the same name – topped the iTunes Electronic Chart in the UK. In December 2014, fifth single ‘Desire’ dropped, climbing to #22 on the UK Singles Chart, which was a giant leap for mankind improvement on the performance of all their previous material. The band made guest appearances on the singles of several other acts last year too, featuring on ‘Illuminate’ by Tourist (known as a Grammy-winning co-writer of Sam Smith’s ‘Stay With Me’), and on ‘Sunlight’ by Belgian DJ and producer The Magician. January 2015 arrived, and Years & Years found themselves winners of the prestigious BBC Sound Of… award, given to the most promising new music talent of the year, and previously handed to the likes of Adele, Ellie Goulding, Jessie J and Sam Smith. They were also nominated for the Critics Choice Award at the Brits, held earlier this year. As if that wasn’t enough, then IT HAPPENED. ‘It’ being Years & Years’ sixth single, ‘King’, released in March. The song not only went straight to the top of the UK charts, but became a worldwide hit too. reaching #1 in Bulgaria, Slovakia and Croatia and the top ten in Australia, Brazil, Germany, the Netherlands and Poland. 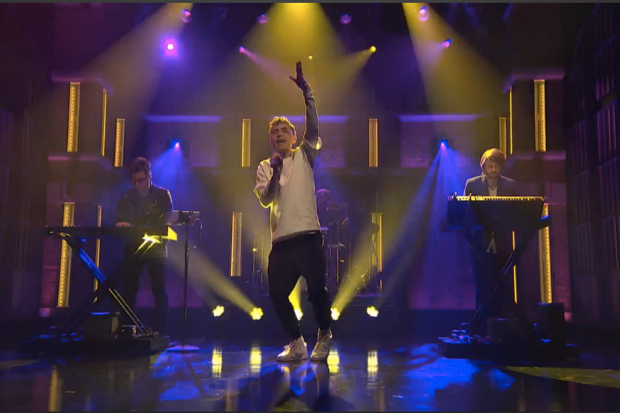 Y & Y giving the US a taste of ‘King’ on Late Night With Seth Meyers, April 2015. The success of ‘King’ was followed by the band’s first album, Communion, released in July. Penned entirely by Olly, Mikey and Emre (with help from a few established songwriters), it entered the UK and Irish album charts in the top spot, also flying high in Australia, Canada, Denmark, the Netherlands, Norway, Sweden and Switzerland (BROAD APPEAL ALERT! ), before topping the US Dance/Electronic Album Charts (AMERICAN BREAKTHROUGH ALERT!). As of October 2015, the boys are waiting to find out if they’ll be named Best UK & Ireland Act at the MTV EMA Awards taking place later this month. Previous winners of such regional EMA awards include Helena Paparizou, Lena, Loreen, Manga, Marco Mengoni, Sakis Rouvas, Voltaj and Who See (there’s a common thread there, but I just can’t figure out what it is). Whether Y & Y take that prize home or not (it’s unlikely, given that One Direction is also nominated and have won it the past three years running), and whether they ever make an appearance at Eurovision or not (also unlikely, but remember – this is a post full of wishful thinking), I’m hooked on their musical stylings. Communion is the best album I’ve heard all year – possibly ever, in fact (and no, I’m not being paid to say that). I can’t wait to hear what else they can do. 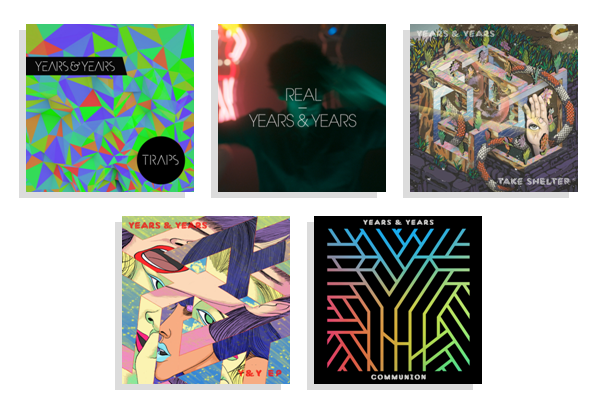 Speaking of hearing stuff…if you’re not familiar with the Y & Y archives, what can you expect to hear when you do get jiggy with it? For the most part, synth-based electropop, with an 80s tinge that somehow doesn’t sound 80s at all (so it’s not quite an example of the ‘Eighties Coming Back’ that Ruffus had in mind). What I mean is, while the synths smack of a different decade, the electropop that’s often combined with R & B and/or house elements is ultra contemporary. It’s so cutting edge, actually, that you might want to wear protective clothing while you’re listening. Communion is 110% hip (I’m down with the kids, y’all), boasting the kind of lush, layered production heard in Margaret Berger’s ‘I Feed You My Love’. And that production is present on both club-ready tracks like ‘King’, and non-soppy ballads such as ‘Eyes Shut’. All in all, it’s the kind of album that’s all killer and no filler. It’s hard to come up with a Eurovision sound-alike for Y & Y, as we’ve never really heard anything similar on the contest stage before. However, if you were a fan of Estonia or Greece in 2014, and Belgium, Latvia or Slovenia in 2015, you might find something to fangirl/fanboy about here. ‘King’ It may not be the song that started it all, but it is the song that made Y & Y famous. I’ll give you a Euro if you don’t get that chorus stuck in your head (and I don’t even have a Euro. That’s how confident I am. Confident and purely in possession of Australian money). ‘Shine’ More laid-back than ‘King’ but just as infectious. You could totally slow dance in a club to this track, at that point in the a.m. when energy levels have waned and the crowd is mostly made up of drunk people leaning on each other so they don’t fall to the floor. ‘Eyes Shut’ Why subject yourself to a lame lady ballad or man moaner when you have ballads like this at your disposal? There’s no eye-rolling required here, folks. ‘Worship’ Dance-worthy, but without the doof-doof beat that gives you a migraine, this is one of my definite highlights from an album with no lowlights. ‘Sunlight’ Chances are you’ve heard this before (especially if you’re Down Under and a regular blaster of mainstream radio, á la moi) but you may not have known who was behind it. Now you do. If you did already, then that’s fine too. Whatever. Their sound Swooping in on the success of “atypical” entries like ‘Rhythm Inside’ and ‘Love Injected’ could be hugely beneficial for the struggling UK, and Y & Y’s trademark electropop fits that slightly misshapen mould. Plus, anything that isn’t a preachy peace-and-love ballad would be welcome, yes? Their stage experience Having performed at music festivals like Glastonbury, on countless tour dates and on TV, these guys can deal with both crowds and cameras. Frontman Olly is the star of the show during live performances, and he’s got no shortage of energy to get audiences going – but he can also eyeball a lens like Loïc Nottet. At Eurovision, their performance would make use of background and lighting rather than props (think Softengine and Sanna Nielsen), making it simple but effective. After witnessing the UK throw everything, including the BBC’s office Christmas light collection, at Electro Velvet’s performance, some minimalism would be a relief. Their credibility Although the UK didn’t make it to the left-hand side of the scoreboard in Copenhagen, I think they did themselves a big favour sending Molly and ‘Children of the Universe’ to the contest. Cool, contemporary and totally respectable, the entry was a step in the right direction. Anything Y & Y could contribute, IMO, would pick up where Molly left off – i.e. even if they crashed and burned, they’d be representatives the UK could be proud of. Did I mention that Olly looks great in glitter? Here he is rocking mahusive chunks of it at Glastonbury Festival. Well, I’ve convinced myself…but then again, I wasn’t in need of convincing. 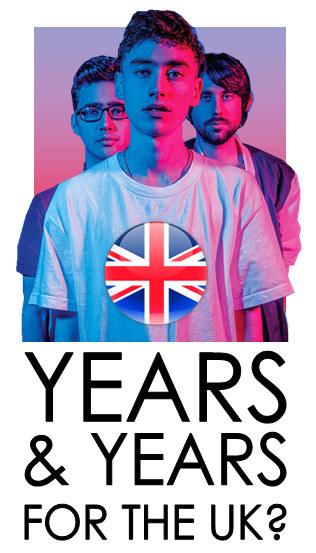 The important question is, how do you rate Years & Years as prospective (by which I mean ‘as if, but humour me, won’t you?’) flag-flyers for the United Kingdom, now that I’ve plied you with information about them? If you need a daily Y & Y fix like I apparently do now (how did I survive twenty-three years without them?) there’s no shortage of places you can visit to get it – and to pester them re: Eurovij. Peer pressure may be frowned upon, but it is effective! With that, I’ve said all I wanted to say for today (I think) so until next time, I’ll leave you to ponder this: if you had the power to pick the next UK representative, who would you choose – and why?